Months after the launch of Apple's much lauded Game Center, the iPhone gaming platform is still in need of quite a bit of work. In this article MTV's Russ Frushtick walks us through what needs doing. Two months ago, Apple launched Game Center on iOS devices. The service is basically a gaming platform, allowing people to have a unified friends list, collection of achievements and a way to connect to other players without using 3rd party apps like OpenFeint or Plus+. In a lot of ways, it mimics Xbox Live, which has become the model of a successful social gaming platform. But Game Center still has a ways to go. Although it managed to meet expectations in terms of functionality, it hasn't become as universally popular with gamers as one would expect. Some of this is due to technical limitations (Game Center only works on iPhone 3GS or newer devices), but some of this is simply due to design. 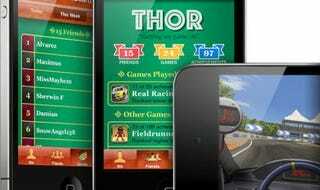 Here are a few ways for Apple to make Game Center a more powerful and successful social gaming platform. Game Center is strange in that it places a big focus on the total number of achievements you've earned, but not on your achievement score. See, each achievement you earn has points associated with it, but you'd probably never know that unless you dug all the way into that game's list of achievements and saw how many points you've earned. Why not bubble up your achievement score to your main user page? After all, people like big numbers, and seeing that you have an achievement score of 1,400 instead of just seeing you've unlocked 32 achievements is way more satisfying. It'll encourage more people to go for more challenging achievements, rather than just rack up their number of dozens of really easy ones. Currently, when browsing your Game Center friends list, all you get are a list of user names with your friends' personal motto and the game they played last. Imagine if, in addition to that basic data, the list also showed your friends' number of achievements or their total achievement score. Suddenly those points you've been earning can easily be compared to the friends on your list, and once you start comparing, they earn a sense of worth. It also encourages you to browse friends' profiles. "Woah, Bill has 32 achievements and 1,400 achievement points? How is that possible?" So you hop in and scroll through his list of played games and notice that he hasn't stopped playing "Farmville" for three years. Or that he earned a ton of achievements in a game that you've never even heard of, giving you a reason to check out that game. Currently the only way to see a player's achievement progress is to dig directly into their profile. Showing it right there on the friends list page would make a big difference. Finding random friends to pad your Game Center friends list is easy. Go to a popular iPhone gaming forum, post your user name, and watch the invites flood in. But finding your real world friends is trickier, as there's no way for Game Center to connect to your contacts database. No Facebook Connect, no connecting to your iPhone phone book, nothing of the sort. It's a shame, because it's way more fun to play with people you know than randoms you don't. Microsoft handled this well on Xbox Live. You could opt-in to Facebook to find Live friends and have the service see which of your friends did the same thing, thus bringing two willing parties together. Seems like Apple could do the same thing and make everyone's Game Center friends lists a lot more meaningful. Something that Microsoft hasn't done is given players the ability to label their friends lists on Xbox Live. If you have dozens of friends, it's sometimes tricky to remember which gamertag belongs to which person. Ditto on Game Center, where your friends list can be even larger. So why not allow players to label their friends with their real names? It wouldn't be public, the labels would just live on the user's iDevice, but it would do wonders to sort out which of your friends list is made up of real friends and which are just random forum-dwellers. The above suggestions are relatively low-impact. This final suggestion is obviously much more involved, but imagine if there was a Game Center website which allowed you to sort through achievement lists, add friends, send challenges and browse new games. Basically Xbox.com, which is a one-stop hub for anything related to your Xbox Live account. Valve's Steam offers similar functionality, as well. Currently the only hub that exists for Game Center is the Game Center app on your device, and it's not terribly easy to mine for information. Although the above suggestions would help to make Game Center a more compelling social gaming product, it really comes down to providing quality games. At present, there are only a handful of games which allow players to compete directly with one another over Game Center, beyond just comparing high scores. Ideally more games will provide this sort of functionality in the future. Later this year will bring the release of iOS 4.2, which will support Game Center for iPad. Hopefully the update is farther reaching than just a new platform and that we'll see increased versatility and an improved interface Game Center, perhaps incorporating some of the ideas above. While we wait for that, pardon me, I have 17 more levels to 3-star in "Angry Birds." Republished with permission from MTV Multiplayer. Russ Frushtick manages gaming and technology coverage for MTV News and is the Editor-in-Chief of MTV Multiplayer. You can follow him on Twitter at @RussFrushtick.